Edqar added a comment to T138554: Tourist map is too rare. Edqar created T138554: Tourist map is too rare. Edqar changed Operating System from os:w7 to os:w10x64 on T138554: Tourist map is too rare. 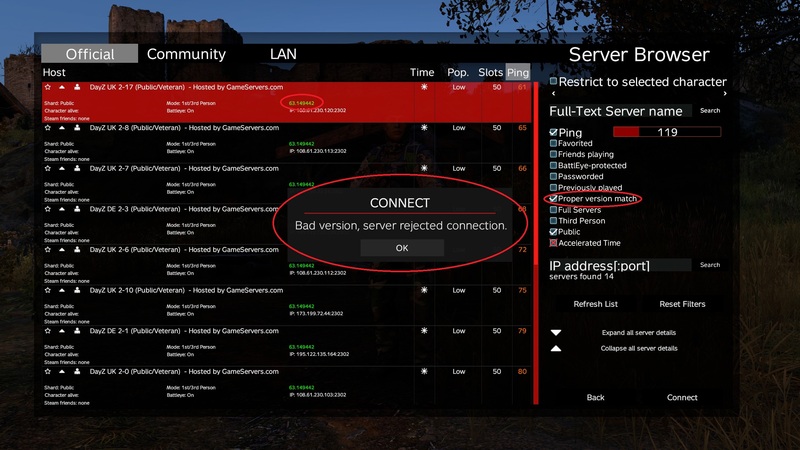 Edqar added a comment to T116986: Consistent server lag/desync. I have experienced lag and rubberband, but not that bad, but still really annoying. Major fps drops randomly, seems like server wide (friends almost every time experience it too, in different location). Some houses causes rubberbanding (near door, mostly when going from inside to out). I can run out like 3m but then it teleports back in (every time exact same position). Edqar added a comment to T133670: Proper Version Match server filter does not work. Yes, i can confirm this too. Edqar added a comment to T133729: Low FPS since BETA went to Stable. Have to say that i have not visited big cities. Smaller ones are okay. Edqar added a comment to T133747: Dropping an active flashlight rotates it 90 degrees. I was wondering this too, when i dropped head light, it always was dropped in 45 degrees to right. Edqar added a comment to T133725: DayZ.com change progress bar. Edqar added a comment to T133681: Cannot start a fire in a brick fireplace. Same here, action doesn't appear. High preset working for me around 80-110 fps. Edqar added a comment to T133691: Too early to BETA. Yes, and maybe i can translate too, Hylsy seems to be Fin. Edqar added a comment to T133703: Head torch doesn't light the way. Yep, noticed this problem. The light seems to be 1m over the head, and does not do any light around me. Have to use it in hand. Edqar added a comment to T133684: Matches do not work. I just used matches to light up fireplace, so that is working. Maybe igniting car ain't implemented yet. Edqar added a comment to T133680: Items do not return to their inventory location when unequipped. Edqar added a comment to T130882: Character Disappeared 0.63. My character was there today, maybe it was the "database lock" case. So problem "solved", It took quite time though. Something like this happened to me too. I was playing, and then server restarts/crhases > character can't be found anymore anywhere. Edqar added a comment to T124990: TrackIR not currently working in 0.62. Edqar added a comment to T121937: 64bit executable unable to utilize trackIR. ...and not working again after 0.62. Hey! i just today tested 64bit, and it works now!! Edqar added a comment to T122154: TrackIR not working with x64 bit exe **DEV BRANCH 12/14**. Would be nice to play with x64, but without trackir...nope. Edqar added a comment to T81288: Stance adjustments not working since 1.40.129.533 update. It's working for me without any manual changes. I checked that config file, and keyadjust was 29. So is this concerning only some players? PS. And no i don't have devbranch on. Edqar added a comment to T81239: Stance modifier key missing. PS. And no i don't have exp on. Edqar added a comment to T76756: Flares are useless (launcher). Flares are now almost useless, they lasts only seconds. I remember from military forces that flares have "parachute" to extend the light!! Edqar added a comment to T73545: Launcher shooting from prone. Edqar edited Steps To Reproduce on T73545: Launcher shooting from prone. Oh yea, thx to you. Edqar added a comment to T66890: Add ability to fire anti-tank weapons while being prone. Edqar added a comment to T66431: separate ammo and magclips/ammobelt as single independent objekts. Voted up because i want to combine clips and different ammos. Its annoying when you have like 2 clips with couple ammo in them and cannot combine them. Edqar added a comment to T61081: Some sort of melee?. I would like to see this function in A3, even for breaking window. HE rpg doesn't go through window wihtout blowing up, and it's pretty stupid waste ammo for it. Edqar added a comment to T58803: PIP screens flicker, most likely caused by SLI / Crossfire..
Edqar added a comment to T58799: Deploying a weapon / proper use of bipods. I think it will come then. I actually started using AGM with our gaming group in COOP sessions, it contains weapon rest and lots of more. Oh and it's AWESOME combined with TFR!!! Upvoted, this is really important for snipers and MGs, but for rifleman too! There is mod what we can use this time..